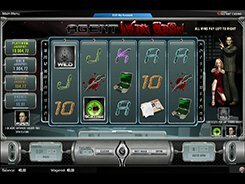 Agent Max Cash is a feature-packed video slot that offers four progressive jackpots. The theme of the game is reminiscent of a detective story or a spy film about two special agents who infiltrate the enemy’s HQs to get secret information. The symbols used in the slot fit in with the theme and include a bloody knife, a briefcase, an armored laptop, top secret documents, and more. The slot is played over 5 reels and 25 paylines, and a wide range of wagering options make the game very appealing to many gamblers. To the left of the game field, you will see 4 progressive jackpot indicators – Platinum, Gold, Silver and Bronze – that show different amounts. A progressive jackpot is awarded randomly regardless of what is happening on the reels; however placing big bets increases your chances of winning it, as the slot developer states. Along with this, the slot features a wild, a scatter, a bonus symbol, free spins and the highest fixed prize worth 25,000 coins for lining up five wilds. Considering that the maximum line bet is $5, you stand the chance of scooping up to $125,000! PLAY FOR REAL MONEY!